Thread: What does Easter mean to you? Just wondering what easter means to you guys whether you are religous and do anyhting special on this day. Me, I took the kids to the zoo and for the kids it means shedloads of eggs! Family brunch after morning mass. Easter allows me to reflect on what was sacrificed for me and my family's salvation. Very thankful. It's almost the same feeling as the Thanksgiving here in the states. 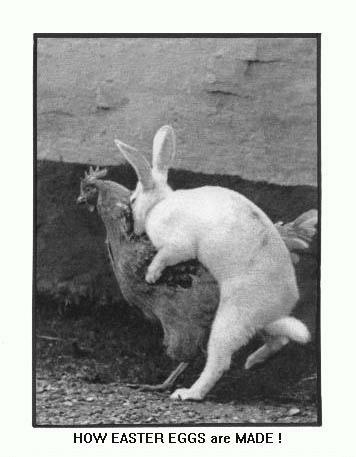 ever wondered where do the easter eggs come from? Manijack I like it bro !! The few comments lead me to another question it always appears to me when ever I visit the US or read about it that Americans are very religous people (I,ve read the bumper stickers!) would you guys say that is true? More religious than many other Western European countries for sure. It's one part of our culture that I appreciate and enjoy. Easter LOL! What a joke! Easter is just another day for my family to fight and get even more pissed of at each other. Easter bah humbug! I feel sorry for you bro. Wish you and your family had the love of Jesus in your hearts and house. Easter? What is that. I am not particularly sure that Americans are more religious than European countries. In fact, none of my friends are religious at all. My gf is the only one who is religious. She is out there making eggs for the kids in her family, while I stay in bed all day. I think the day has lost lots of meaning with the paganization of the day. i.e Bunny for easter and santa claus for Christmas. I never reflect back and say, this was the day that Jesus was born. More like, great now I have to watch my family fight all week long. Well you can kinda tell that I am not religious, but I am not going to rain on anyone's parade. Family,s I always remember the saying "you can choose your friends but not your family"
We don't have big get togehters anymore simply for the reason everyone is at eachothers throat but I have my own family now so they are the ones I spend my time with. I usually have a big dinner with the family. My only real dislike of Easter is the fact that the gym is closed. ARGH! Good answer cane, Easter is the day that the Lord Jesus Christ defeated death. Jesus loves us and he gave his life for us that we may have eternal life through him, he was crucified and on the 3 day he arose, and thats why we celebrate Easter.